A dev shows a React and D3 library he's been working on. The goal is to build a React and D3 library that never gets in your way. Read on for more! I'm working on a React and D3 library that I've been thinking about for two years. My goal is to build simple-react-d3, a React and D3 library that never gets in your way. Most libraries give you composable and reusable charting components that are easy to use and quick to get started with. They're great for simple charts. VX comes closest to the ideal get-out-of-your-way library, and even with VX, when I recommended it to a friend, it took all of 10 minutes for him to hit the wall. "Wtf, how do I do this? The library is fighting me!" The best way to get started was to generalize the D3Blackbox pattern I developed for React+D3. It's the easiest and quickest way to render a random piece of D3 code in your React project. Take some D3 code, wrap it in a function, pass it to a HOC (higher order component), and you're done. The HOC renders an anchor element, and your render function uses D3 to take over and manipulate the DOM. This approach doesn't give you all the benefits of React, and it doesn't scale very well. It's meant for simple components, quick hack jobs, or when you have a lot of existing D3 code you want to use. 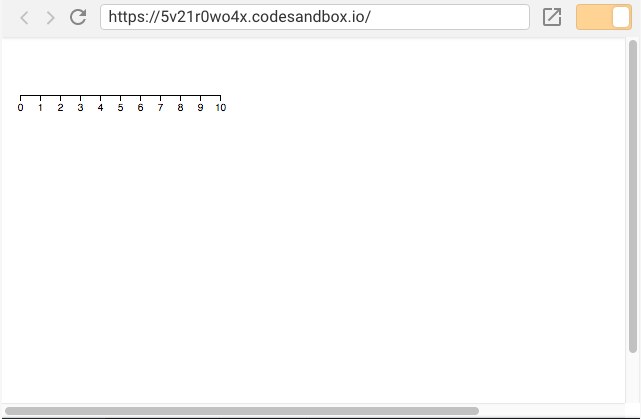 It is the easiest and quickest way to translate any random D3 example to React. But what if you're the kind of person who doesn't like HOCs? 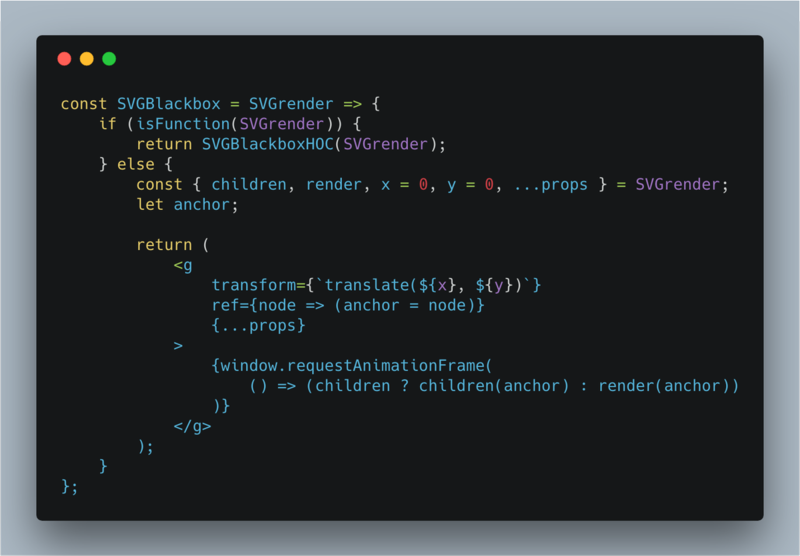 Maybe you prefer render props or function-as-children? "Can we make this HOC work as not a HOC too? What if it supported all popular React patterns for reuse?" It's a function, SVGBlackbox, that takes a function as an argument and acts like a HOC. Pass in a func, get a component back. Just like the D3Blackbox example above. Unfortunately, the internet told me this is a terrible pattern, and I should feel bad. The window.requestAnimationFrame part can lead to all sorts of problems and likely clashes with the future we're getting in React 16.3. Make it a class? You can also return a child component that is a class. It's also possible to do this logic in a ref callback but that's a little obtuse. The idea of shoving render prop stuff into the ref callback smells like black magic. It's so crazy that it might just work. Now the tricky part: a ref callback that invokes your render function. That's right, you can hand over control of the anchor element in the ref callback. This works but trips up on React's caveat about ref callbacks sometimes. Still feels a little dirty, but much better than the requestAnimationFrame approach. Shouldn't mess with async stuff in React 16.3 either, I think.